Happy New Year! Did you make a New Year's resolution? Forbes identified #1 most common New Years resolution as going on a diet...and also as the most difficult to keep. More practical, they say, is to make small changes to your eating habits. Instead of just generically trying to "eat healthier," maybe identify tangible goals—eliminating butter, consuming less red meat, eating 5 servings of vegetables a day. Whichever goal you pick, you've come to the right place to achieve it! In this recipe, the shrimp is paired with fennel—a lovely (and seriously underused, I must say) member of the parsley family, native to the Mediterranean. Armed with phytonutrients plus vitamin C, dietary fiber, potassium and folate, the versatile vegetables provides a great crunch and anise-like bite when eaten raw, but I prefer it cooked: emitting a tender, fragrant liquorish-esque flavor, the liquorish hues soften and becomes sweet; complementing the mild shrimp wonderfully, and staying within a Mediterranean theme. (Fennel pairs well with any flaky white fish, too.) Constantly looking for recipes that display a vegetable's full array of tastes and textures, I love when the same vegetable can be used more than one way in a dish, as is the case here: while the sturdy bulb is chopped and cooked through, the delicate feathery fonds at the tip—resembling fresh dill—lend themselves perfectly to a pre-serving garnish. This recipe hails from Ina Garten's new cookbook, Barefoot Contessa Foolproof. While the title promises straightforward directions and easily accessible ingredients for an un-mess-up able dish, I did make a few changes to the original recipe. Ina serves these shrimp as an appetizer, suggesting chunky bread slices for sopping up the fragrant, garlicky broth, but I was perplexed when my dish came out with no more than a tablespoon of this very tasty (but seriously scant!) broth. [Insert pouty face here.] This might have been a result of halving the olive oil, but nonetheless, there are a few ways to increase the liquid while keeping the oil minimum: double the fennel (the natural water from the vegetable will seep out when cooked), or add 2-3 tablespoons cooking/white wine along with the garlic and red pepper. I prepared mine as a main dish, and topped the succulent shrimp over yellow rice, which became delightfully thick and saturated as the juices seeped down into the bowl. Depending on the culture of your cuisine, the "yellow" in yellow rice may originate from different spices: in Spain, saffron; Caribbean, annatto; or Indian, tumeric. As the first is expensive and the second obscure, I made mine with the accessible and super healthy tumeric. Dr. Andrew Weil, founder of the Arizona Center for Integrative Medicine, writes that "the therapeutic advantages of turmeric and curcumin [its main active ingredient] are almost too numerous to list." To sum it up, curcumin's anti-inflammatory properties make the ginger-relative a leader in disease prevention, exhibiting antioxidant, antiviral, and anticancer properties to help protect against diabetes, allergies, arthritis, and Alzheimer's disease. "Looking for a simple New Year's resolution for health?" asks Dr. Weil. "Add turmeric to your diet." Done! 1. Heat the olive oil in a large (12-inch) saute pan over medium heat. Add the fennel and saute for 5 minutes, until tender but not browned. Turn the head to medium-low, add the garlic and red pepper flakes, and cook at a very low sizzle for 2 to 3 minutes, until the garlic just begins to color. If using cooking or white wine, add here. 2. Pat the shrimp dry with paper towels, add them to the pan, and toss together with the fennel and olive oil. Spread the shrimp in one layer and cook over medium heat for 2 minutes on one side. Turn the shrimp and cook for 2 minutes on the other side until they're pink and just cooked through. 3. Off the heat, sprinkle with parsley, 1 tablespoon of chopped fennel fronds, the Pernod (if using), the fleur de sel, and black pepper. Serve with bread or yellow rice to soak up all the pan juices. Bring onion, rice, chicken broth and water to a boil in a large saucepan. Reduce heat to low and simmer, covered, until tender and most of the liquid has been absorbed, 40-50 minutes. Let stand (still covered) for 5 minutes, then fluff with fork. Add tumeric, and mix throughly. Spoon into bowl, and top with shrimp, ladling generous amounts of broth into serving bowl too. Garten, Ina. 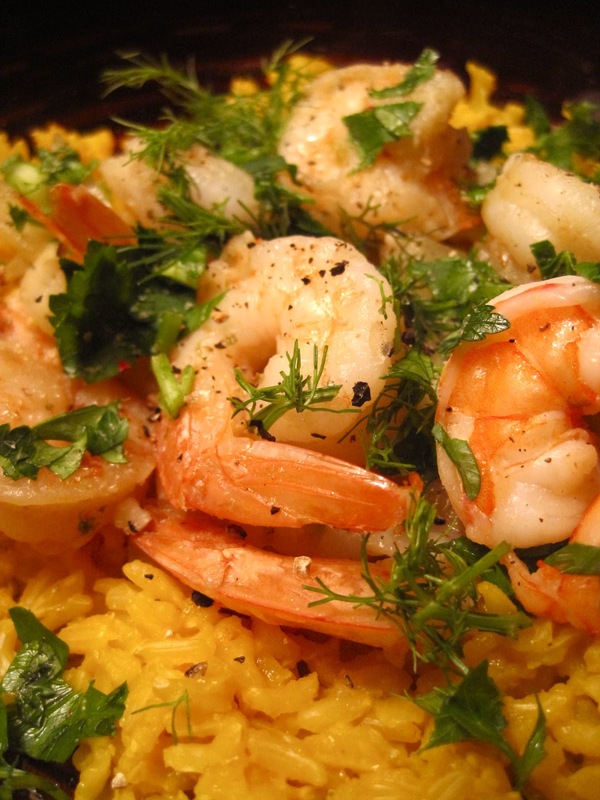 "Fennel & Garlic Shrimp." Barefoot Contessa: Foolproof. London: Bantam, 2012. 92-93. Print. Rose Shulman, Martha. "Fragrant Fronds, Pungent Bulbs: Cooking With Fennel." Recipes for Health. New York Times, 7 June 2010. Web. 3 Jan. 2013. Weil, Andrew, Dr. "Turmeric Health Benefits: Have a Happy New Year With Turmeric." The Huffington Post. N.p., n.d. Web. 2 Jan. 2013. <http://www.huffingtonpost.com/andrew-weil-md/turmeric-health-have-a-happy-new-year_b_798328.html>. GORGEOUS photos! Any suggestions for a substitute for the shrimp to make this vegetarian?